Family-owned & operated with combined 25+ years home improvement experience. Imagine what your home remodeling project could look like! Big or small your home improvement project will be exciting & stress-free! Home Improvement Contractors in Annapolis Maryland. We provide professional, quality services for all your home improvement projects! Since 2007, Tomas Brothers Home Improvement LLC has been providing homeowners in Anne Arundel County Maryland and beyond with a broad spectrum of professional and quality home improvement and home remodeling services. 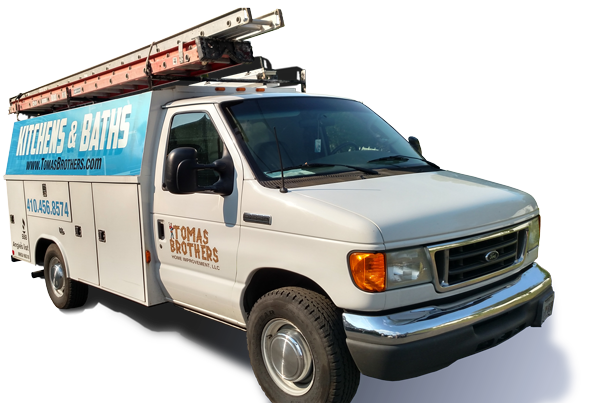 Family-owned and operated - licensed Maryland Contractors, Tomas Brothers Home Improvement believes communication is key to all successful remodeling projects, and we pride ourselves on implementing constant contact as well as a project schedule and timeframe with each client. From start to finish, TBHI promises each home improvement remodeling project will be met with superior craftsmanship and a seamless experience. Tomas Brothers Home Improvements takes pride in the selection and quality of home improvement services we offer. No matter how small or large your home improvements are, we can turn your vision into a reality. Kitchens, baths, basements, additions, decks and porches, remodeling, windows, doors, flooring, custom carpentry and general home improvement services are just some of our key specializations. Thinking about remodeling your kitchen or bathroom; it’s one of the best ways to increase the value of your home. Tomas Brothers Home Improvements is capable of achieving the results you’re envisioning, while catering to your individual budget for home owners in Annapolis, Pasadena & throughout Maryland. A well-designed addition or if you are remodeling a room, you can significantly boost your home’s overall worth. Interested in expanding your living space? Tomas Brothers Home Improvements can offer custom new home addition solutions that work with your budget, residential property and schedule. Dreaming of a new playroom or movie room for your family? In need of an extra bedroom or laundry room? Your basement is the perfect space, and Tomas Brothers can turn this area of extra square-footage into added value for your home. Dreaming of a deck or porch that will perfectly complement your home and yard? From custom ACQ pressure-treated decks to low-maintenance vinyl and composite decks, we can provide you with designs and an endless variety of decking and railing supplies and materials. Replacing those old, drafty windows and doors is the perfect way to save money on your energy bill and add value to your home. TBHI offers Energy Star-rated products at affordable prices. Tomas Brothers can manage the entire installation process for your new flooring. We specialize in wood, tile and laminate flooring, using high-quality products and installation methods that will ensure your new flooring looks just as good five years from now. Whether you’re interested in crown molding, chair rail, wainscoting, or just basic baseboard, casing and window sill projects, Tomas Brothers can flawlessly execute your vision. Have any small projects around the house you just don’t have time for? Give us a call and we’ll be right there whether you live in Pasadena, Glen Burnie, Columbia or yes Annapolis Maryland! Need some inspiration for your next project? Interested in seeing some of the transformations we’ve made? Our quality craftsmanship speaks for itself through our portfolio of recent projects. Tomas Brothers has renovated almost my entire home. They are precise in all they complete. Dan is very professional, punctual and always treats my home as if it was their own. Simply the best home improvement company! These are serious professionals (Dan and Greg) who obviously take pride in their work. We are extremely pleased with their craftsmanship, oversight and communications. We dealt with Greg throughout the job and always knew when and what was going on. He provided good ideas for the renovation challenged person that I am. They did an excellent job, on time and within budget. Knowledgable, efficient, skilled in correct construction methods, pleasant,...Greg was great to work with. He did a super job on a difficult repair. We would hire him again in a heartbeat- Tomas Brothers team was terrific and job was fairly price. Everything was great. All the guys who were working were great. Dan made the process smooth. Whenever any issues came up with the house, he took care of them. They cleaned up everyday and were very efficient. Everything I asked for was done and when I just gave a general idea of something, they came up with somthing beautiful. They far exceeded my expectations! I still can't believe it is my house. Thank You so much to Dan and his team! - Patricia B. Outstanding job and high level of professionalism! - John K.
These days it's not easy to find contractors who take pride in their work and show a genuine interest in pleasing their customer. Tomas Brothers definitely fits the mold! We were very impressed by their prompt and professional work ethics, as well as the quality, timelines and neatness of the work performed. Tomas Brothers truly delivered in all areas! We are extremely pleased with our deck and with the company as a whole. We will not hesitate to hire them for future jobs and highly recommend them to anyone. They do great work at a fair price! - Marion S.